The Republic of Cyprus, as a relevant party, will participate in a conference, scheduled for 12 January, in Geneva, on the Cyprus problem, the government has stressed, pointing out that the January meeting will deal with amendments to international conventions which concern the Republic. Deputy Government Spokesman Victoras Papadopoulos, in a written statement issued here today following claims about the conference by the Turkish Cypriot side, also said that any other interpretations do not correspond to what has been agreed on December 1st by Cyprus President Nicos Anastasiades and Turkish Cypriot leader Mustafa Akinci. At a dinner on December 1st, the two leaders decided to meet in Geneva on 9th January, on the 11th they will present their respective maps. From the 12th of January, a Conference on Cyprus will be convened with the added participation of the guarantor powers. Other relevant parties shall be invited as needed, they said. “The President of the Republic Nicos Anastasiades would like to clarify the following: At the dinner on December 1st, the following was agreed between President Anastasiades and Mr Akinci, in the presence of the Special Advisor of the UN Secretary General – and this was reflected in the press release issued after the dinner: a three-day meeting and negotiations between President Anastasiades and Mr Akinci, in Geneva, between 9-11 January,” Papadopoulos says today in his statement. “It is crystal clear that other relevant parties will have to be invited, according to the needs and the objectives of this conference,” Papadopoulos says in his statement. It is equally important, the statement points out, to ensure the presence of the EU, to which Cyprus belongs. The UN and the Security Council must also be present, it adds. The UN, it notes further, will be called upon, through a strong resolution, to adopt anything that may be eventually agreed and subsequently secure implementation of everything that is agreed. “Given the above, any other interpretations do not correspond at all to what was agreed at the dinner on December 1st,” Papadopoulos stresses, in respond to claims by the Turkish Cypriot side, which talked about a five-party conference (the two sides and the three guarantor powers), saying that other parties will be invited, if necessary, with the approval of the sides. A statement issued on December 1st by the UN Spokesperson said `tonight, the Greek Cypriot leader, Mr. Nicos Anastasiades, and the Turkish Cypriot leader, Mr. Mustafa Akıncı, met at the Head of Mission’s Residence in the UN Protected Area (UNPA) under the auspices of the Special Adviser of the Secretary General (SASG) on Cyprus, Mr. Espen Barth Eide`. He adds that the two leaders assessed the state of play of the negotiations and exchanged views on the way forward. “The leaders have decided to immediately re-engage in their negotiations and have instructed their negotiators to continue meeting in order to achieve further progress on all outstanding issues interdependently. The leaders will also meet as required”. Furthermore, he notes that in line with their joint resolve to reach a comprehensive settlement as soon as possible, they further decided that they will meet in Geneva on the 9th of January 2017. `On the 11th of January, they will present their respective maps. From the 12th of January, a Conference on Cyprus will be convened with the added participation of the guarantor powers. Other relevant parties shall be invited as needed” he concludes. Cyprus has been divided since 1974 when Turkey invaded and occupied its northern third. 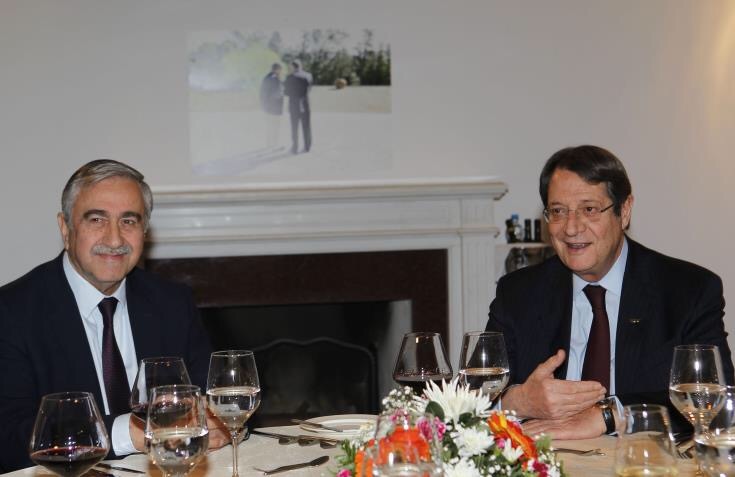 Τhe leaders of the two communities in Cyprus, namely President Anastasiades and Mustafa Akinci have been engaged in UN-backed talks since May last year, with a view to reunite the island under a federal roof.